Middle School camp is offered at both of our camp locations—Youthfront Camp West in Edgerton, Kansas and Youthfront Camp LaCygne in LaCygne, Kansas! We believe God has blessed us with one of the finest camp ministries in the country because of our incredible and dedicated staff. Our full-time staff have decades of camp experience as they create the best possible program along with hiring high quality Summer Staff. Our Summer Staff are college-age people who genuinely care about kids and facilitate our camp program. 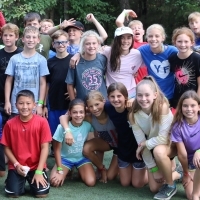 We conduct extensive interviews and background checks for all of our staff hired to make sure that your campers have the most capable and trustworthy leaders during their session of camp. We have at least two staff per cabin and one staff member to every 4 campers across our camp, so you can rest assured that your child will be cared for at all times. We structure our days around the practice of prayer, so we start each day together in our Chapel for Morning Prayer. This prayer times includes reading scriptures, music, silence, and both corporate and private prayer. Campers gather together in our Chapel each morning for worship and to hear from our Storyteller about our theme for the session. We set aside 30 minutes each morning for campers to reflect on what they are learning about God and their faith. This time can include silence, journaling and scripture reading. We provide age appropriate camper journals for each camper that helps guide them during this time each day. We block out the rest of the morning to spend time together as a cabin! This time is for team building activities, games, and tactile experiences that reinforce the theme from our Storyteller in Morning Gathering. Our entire camp pauses and gathers together in our Chapel for Midday Prayer. This prayer includes scripture reading, music, silence, and both corporate and private prayer. Each day we open all of our camp activities and facilities for campers to hang out with one another and our staff. In addition to our main attractions (pool, splash park, waterslide, ropes course and more! ), there are organized activities offered throughout the afternoon. We offer freedom for kids to learn how to make choices on their own and build authentic relationships with one another and God in the context of camp community. At the same time we value camp being a safe place for kids that is appropriately supervised. Campers gather together in our Chapel each evening for more worship and to hear from our Storyteller! Each night at camp has a different theme (or what we call Hype), and staff and campers will dress in costumes for all out fun and craziness! Stay tuned for this year’s themes! After settling down and getting ready for bed, campers will turn lights out and get some Zzz’s in order to be ready for another full day!